The trunk or stem of the tree is the main supporting structure that holds up the branches. 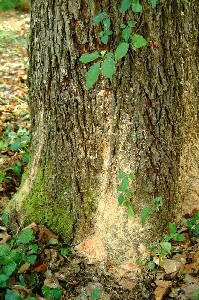 Absence of bark on the trunk can indicate a dead section or a fungus attack. Large areas of the trunk that do not have bark indicate a larger section of dead wood and thus increased risk of tree failure. A long streak of missing bark coming down the trunk usually means lightning has hit the tree. Use binoculars to look into the treetop for cracked, shattered and/or broken branches. If insects attack a tree’s trunk, you will probably see frass, fine light-colored sawdust shavings like the borer frass (left). 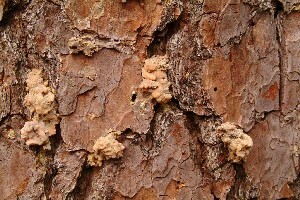 In pine trees, the presence of “pitch tubes” resembling little balls of light colored sap about the size of a marble (right) is a sign of beetle attack. Expect to see dead branches in the crown (if not an entire dead top) if insects are present because they or their larvae often obstruct the flow of water to the treetop. The location and amount of dead wood in a tree can tell you much about its health, and almost every large tree has dead branches. 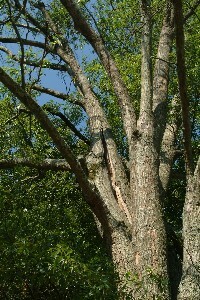 Dead branches in the lower sections of a tree are normal and a sign of inadequate sunlight. 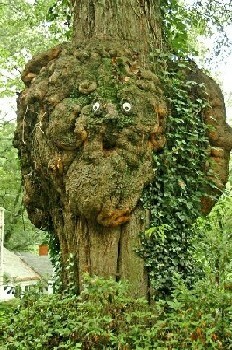 The tree will naturally shed these. Branches dying back from the tips like on the tree at right indicate that the tree’s health is somehow compromised, though dead twigs might be too small to cause any threat to a climber. Large numbers of dead branches located high in the treetop usually tells you the tree is dying. Brown leaves or the absence of leaves (with the rest of the tree in full leaf) indicate a dead branch. The loss of bark or fungus growing on a branch also indicates a dying or dead branch. The most obvious way to prevent risk in a tree is to remove dead or broken branches. Dead branches can be easily spotted when the tree is in full leaf. Use binoculars for a closer look as you look for broken branches. Pruning a small amount of annoying twigs that get in your way does not harm a tree. Decay or rot pockets sometimes exist on the upper side of a branch, making them invisible to ground observation. To avoid accidental branch breakage, it’s better to climb a tree close to the trunk (trunk route) if it is a wild or unfamiliar tree rather than climbing out on branches (branch route). The weak branches need to be pruned or avoided in future climbs. "Widow makers" are life-threatening broken branches that are hanging precariously or lodged in a tree. These branches can come crashing down with a slight wind, be shaken down while climbing, or be dislodged by a gentle touch. Climbers of wild trees must be constantly aware of these dangerous broken branches, which should be identified and avoided. IMPORTANT! Dead branches and widow makers should be removed by the lead climber before the rest of the climbing party enters the tree. When widow makers or dead branches are being removed, it is particularly important that the lead climber, as well as those who might be even remotely near the tree on the ground, wear a helmet. 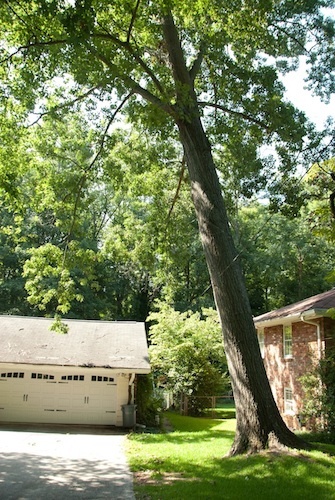 A tree with a lean may present particular challenges and benefits to a climber. Trees leaning out over water or hillsides can offer a beautiful view of the surrounding area. However, climbing dangers include the possibility of the tree uprooting or breaking under the added weight of the climber. Check for the following before climbing a leaning tree. The trunk base opposite the tree lean. Rake back the leaves around the trunk opposite the lean and look for air spaces between the dirt and the trunk, which can signal a tree in the process of uprooting. Fungus or decayed roots opposite the lean increases risk significantly. 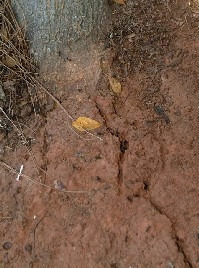 Raised soil. Inspect the ground for raised or cracked soil opposite the lean and/or broken root ends emerging from the soil. These signal a tree in an advanced stage of uprooting. Cracked trunk. 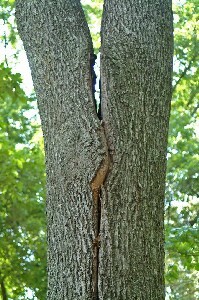 Leaning trees often produce visible cracks produced by the tremendous weight stress. Carefully look around the first ten feet (3 meters) of the trunk. The cracks are usually obvious because of the exposed lighter colored sapwood or raised seam ridges over older cracks. Dead branches on the ground. Wind and rain will naturally break off dead branches. If you spot some dead branches lying on the ground, especially large ones, step away from the tree and look up. Try to locate where they came from. You can usually see where they have broken off. If you see numer­ous broken branch ends above you, consider the tree dangerous and unsafe. Needless to say, if you see a tree with few branches left attached to a tree, it has been dead for a considerable length of time and should not be climbed. Missing bark. When a tree dies, sections of bark will drop off. Sometimes a branch or only a part of the tree will die, and the bark will eventually drop off the dead section. If you see that a tree is totally devoid of bark, the tree has probably been dead for a while. Softwoods, such as pines, will lose their bark more quickly than hardwoods, and are much more unpredictable. Move away from the tree immediately! Discolored bark. Obvious areas of discoloration, like blotches of gray, can often mean fungus attack. Don't get discoloration confused with lichen or moss growth, which is natural in humid regions. Absent buds. Look at the bud ends with binoculars. If the branch ends lack bud ends or they appear stunted, the tree or branch may have recently died. It may be helpful to compare the bud ends with trees of the same species living in the immediate area. Fungus growth. Tell-tale fungus grows only on dead and decaying wood. If it’s found on the ground, there is usually root decay. Fungus growth on the trunk signals dead or decayed wood. Branches with dead or decaying sections can also harbor fungus growth. The presence of leaves in the middle of winter. If you see brown leaves on a hardwood tree in the middle of winter and there are no other trees of this species with this sign, consider this tree dead. It died the previous season and the normal process of leaf fall (abscission) did not occur. Move away from the tree immediately.